Lighting a Fire: An Award! Is this really summer "vacation"? I don't know about you but I haven't had a moments rest yet! :) I am writing a quick post to say that I will probably be absent from blogland for the next 2 weeks. My father-in-law, brother-in-law and step-mother-in-law are arriving tomorrow for an 8 day stay. The day after they leave, my mother-in-law arrives for a vacation. Needless to say, I am going to be busy!! 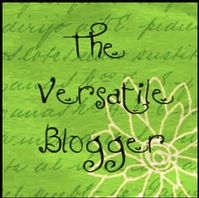 Before I take a pause in blogging I want to thank the TWO people who gifted me with the Versatile Blogger Award! I am going to break the rules a bit- please don't take the award away! I know that this award has been going around and a lot of my blogging friends already have the award but many of you still don't- so please take this as my gifting of the award to you! I enjoy reading everyone's blogs, I must because I spend a lot of time reading what ya'll have to say! I am continually impressed with the creativity and passion for teaching that I see on your blogs and you inspire me to be a better teacher! 7. I like to read books in one day. I am your newest follower. I am a 3rd grade teacher going into my fifth year of teaching. I am somewhat new to blogging and have been inspired by all wonderful blogs out there, including yours!